Being a budding DIY hobbyist myself (yes, I've learnt how to solder! yay! <grinz>), I needed a good source of parts. Ordering parts from the U.S. is expensive, and parts available locally (Singapore) are limited. I happened to be going to Kuala Lumpur, Malaysia for a couple of days, and thus decided to check Octave Electronics out, for I heard they have a vast range of parts and kits. .... blah blah blah .... some time later, Mr Michael Loke, the "Chief", came back. So I proceeded to ask him what parts and kits were available, prices and so on. Through the 1.5-hour-long conversation, I came to learn about his business philosophy.... he is constantly trying to improve his products, while at the same time trying to keep prices the same. (Be prepared to see their improved kits retailing at about the same prices) He is also trying to encourage more Hifi enthusiasts to take up DIY as a hobby. 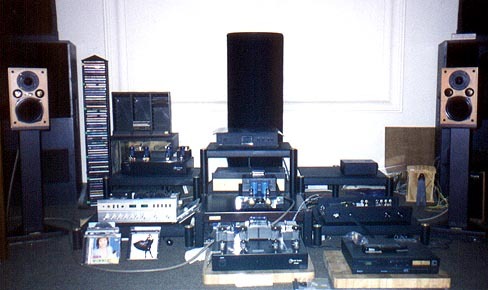 And DIY hifi, if done properly, is in no way inferior to commercially available products. In fact, they can sound as good as commercial hifi products that are much more costly. But then again, there are klutzes like me who will botch the job and end up with blown speakers and amps : ) . He also explain that all the products / parts that he carries have been tried and tested by Octave staff, including himself. He also has a group of regulars who ever eager to test out new products / parts. He stressed that he will not sell something without trying out and testing it extensively. On the left are some pictures of parts available at Octave, they should give you a rough idea of the amount of DIY parts stocked there. This was just 1 display case. The 1st picture shows some cables, probably for making interconnects / speaker cables and equipment internal wiring. They also have an interconnect "kit set" going for a cheap price. Involves wire braided around a teflon tubing. The 2nd picture shows Audax speaker drivers, among other parts. I was surprised when I saw the Audax, never new there were dealers for these wonderful French drivers, using cones with materials made from Aerogel, carbon fibre, kevlar and coated paper. 3rd picture, more parts. 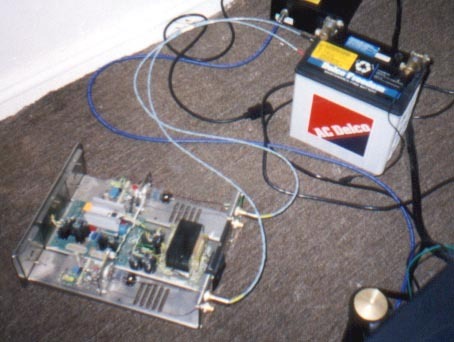 Those copper coloured coils are Solo foil inductors, which enjoys a good reputation among internet DIYists for good sound. Those black cylinders above the Solo inductors are Solen polypropelene capacitors. 4th picture, more parts and components. Those plastic baggies contain upgrade kits, such as LC Audio's XO clock, and AD825 op-amp replacements (These 2 are CD player upgrades). Some of the kit sets / built-up products can be seen here. All the kit sets have been built around an easily adaptable chassis of common design, so that cost is low, and pricing can be kept low. Their new kits will feature new face plates. 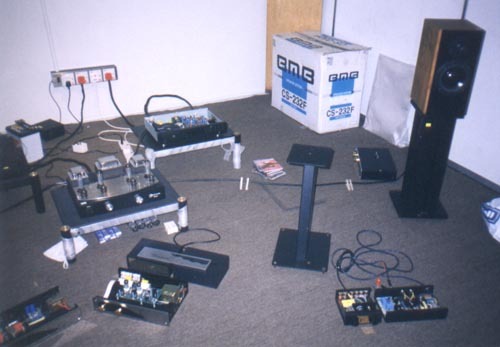 They can be seen at the AV Fest in Kuala Lumpur, Malaysia in August 2000. The 1st picture shows a phono stage. The 2nd shows the DAE-2, which is a an improved version of the original DAE-1 (Digital Audio Enhancer, which is essentially a tube buffer stage). It features a newly added source select for convenience, and gain control for better matching between components. The 3rd picture shows the same DAE-2 without its cover. On top of it is the 24bit/96kHz Octave Etude DAC. This too will feature a new chassis and a similar face plate to the DAE-2 shown in the 2nd picture. Note the interesting use of clothes pegs as cable suspenders can be seen here. Battery powered... soon a whole range of battery powered products from Octave. I guess we can expect a lower noise floor due to the cleaner power from the batteries. A modified Marantz CD63. On the right, you can see the (small) LC Audio XO Clock mounted sideways onto the chassis. The caps (blue Philips(?) caps) have replaced the original caps. He is also experimenting with a IEC RF Filter on the top left, and a filtering cap in hope of cleaner power and better sound. 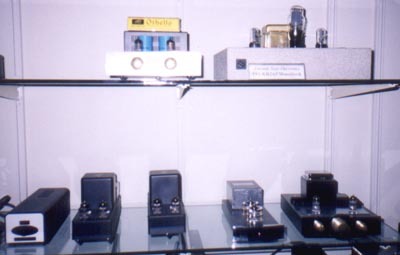 Some "High End" audio parts on display here. 2nd shelf: Hovland Musicaps. High grade polypropelene film and foil capacitors. One of the best around. Sweet and transparent. 3rd shelf: Some other caps. Octave's own caps, Solens, etc. 4th shelf: Elna electrolytic caps. Tiny Holco and Kiwame resistors.